Survey No. 176/1, Goa-403 601. Airport: 25 km., Railway Station: 8 km. 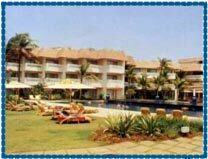 Hotel Club Mahindra Beach Resort is located along the shores of the very beautiful Varca beach. Hotel offer 55 rooms and suites that have been decorated with the best available amenities. These rooms and suites have a decor that can be the envy of several other hotels of this category. 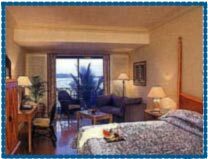 The soul is stirred with the view that is offered by the rooms of this yet elegant 5 star hotel of Goa. Banquet & Conference facilities, Health Club, Swimming Pool, Disco, Sports, Room Service, H/C running water, Telephone, T.V., Channel music, Doctor on call, Laundry, Changer, Fax, Safe Deposit, Valet, Doctor on call, Laundry, Changer, Fax, Safe Deposit, Valet, Room Service.